Ferguson wasn’t overly-impressed with his side’s form in a 2-0 win over Gillingham at the ABAX Stadium, but he praised his side’s defensive strength and will-to-win as goals from Marcus Maddison, from the penalty spot, and substitute Matt Godden secured back-to-back three-point hauls for the first time since the end of October. Marcus Maddison is delighted after scoring for Posh against Gillingham. Photo: Joe Dent/theposh.com. 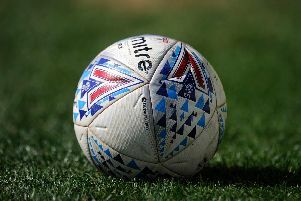 Doncaster scraped past bottom club Bradford City to keep a five-point lead over Posh in the final play-off place, but Ferguson’s men still have a game in hand. Posh face two tough away trips now to play-off contenders Blackpool (April 13) and Fleetwood (Good Friday, April 19). “It wasn’t a great spectacle by any means,” Ferguson admitted. “Particularly in the first-half when we were way off it. We were a lot better in the second-half and my substitutions made a difference. “Ivan Toney did well to start the game. He’s had a sore groin and barely trained for 10 days and he looked laboured as a result so Matt Godden immediately gave us more energy. I don’t think he lost a header after he came on either and his goal was fantastic. The play between Matt and Marcus for the goal was much more difficult than they made it look and Marcus took the penalty well as well. “We have two outstanding players out wide in Marcus and Siriki Dembele. They have both bought into the need to work hard, but they both have great natural ability. I like Siriki a lot. He needs coaching when to pass the ball and when to shoot, but the potential is huge. He’s an exciting talent. Matt Godden celebrates his goal for Posh against Gillingham. Photo: Joe Dent/theposh.com. “It wasn’t the most enjoyable game, but winning is all that matters at this stage of the season, We have to keep putting as much pressure on Doncaster as we can so we couldn’t do any more than win today. “The lads put a great shift in again. The effort and workrate was there and my centre-backs Ryan Tafazolli and Rhys Bennett were outstanding against a very good striker in Tom Eaves. Bennett replaced on-loan Ben White who suffered an ankle injury in training. He should return next weekend. Joe Ward was absent today to be with his ill father. Ward will return to the squad at a time of his own choosing.